OTT may be the messiah of modern media. More than half of 22-54 year olds didn’t watch paid TV in 2017, according to a marketing agency study. The shift from traditional broadcast, or cable viewing, to more fluid, video-based behaviors is swiftly making its mark. This year, 90 percent of Millennials claimed they regularly binge-watch. The thirst for entertainment on-demand is strong and growing. But what’s behind it? Simplicity and customization. The leaders of effortless entertainment — Netflix, Amazon and Spotify — all share a common mission to make people’s daily lives better by surrounding them with what they need, at the moment they need it, through a personalized entertainment experience. OTT is quickly becoming mainstream. The number of people cancelling their traditional pay-TV plan to rely solely on streaming will climb to 33 million this year. According to a recent survey, Netflix is now the most popular platform for watching entertainment on TV, ahead of traditional cable and broadcast television networks. Yet, there is a war coming. Amazon, Netflix and new OTT entrant Disney will battle for dominance. Late last year, Disney pulled all content from Netflix in advance of winning the bid to acquire an additional 30 percent stake in Hulu, raising its ownership claim to 60 percent. With this move, OTT welcomes a master creator and dominant force in long-form entertainment. Amazon, however, owns the distribution game by already being in nearly two-thirds of American homes. The most successful OTT model will be one that looks not just at content, but distribution dominance, as well. It’s why YouTube Premium, Facebook Watch and IGTV have emerged. They know their distribution worth and are building quickly toward this new TV future. Netflix, Hulu, Amazon Prime and the like have vast user data banks from which to strategize and create content. They know what people want and when they want it. It’s a self-fulfilling pop-culture engine of desire and delivery. Personalization means more custom, premium, contextual opportunities for advertisers. The abundant development in the space from studios at Amazon, Netflix and Hulu means the opportunities are more plentiful than ever. The creative ecosystem for OTT also includes a host of niche to powerhouse players that deliver on core passions for specific audiences. In addition to the core OTT studios, there are media houses developing series and films customized for their unique audiences, such as Condé Nast Entertainment, Awesomeness TV, Bleacher Report, Vice and Mitú, among many others. The internet is the new Hollywood. By the end of 2018, Netflix will have 1,000 originals on its platform. In the second quarter of 2018, Netflix released around 452 hours of U.S. original programming, up 51% year-over-year. Some of these projects are self-produced, such as Stranger Things, but most are produced under collaborative arrangements or licensing agreements. 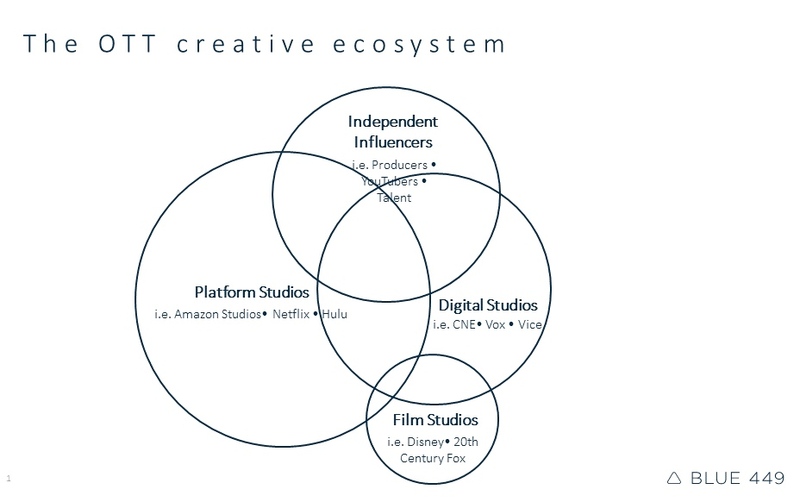 Creation this vast comes from an ecosystem of studios, production houses and creators that often license specifically to the platform and are simply branded as originals. While the platform’s studios are currently driving creation, the most progressive creation for the space is coming from digital studios and influencers who once used YouTube as their home. The difference in the OTT environment creatively is the tenor of the creative product. These projects are more experimental and afforded longer narrative arcs than in previous distribution environments. Don’t believe it when people say our attention spans are shortening. If the binge trend has proven anything, it’s that we adore epic storylines and deep character development that slowly unfolds and draws us in with each click of the “next episode” prompt. The just-announced Game of Thrones prequel project is proof. In the future, look for a push toward live OTT that mimics the once-hallowed ground of pay TV. At this year’s NewFronts, Hulu announced its dedication to live TV, chipping away at the last bastion of traditional ownership. Price. The antiquated pricing models of traditional pay TV built around channels hundreds deep no longer speak to a consumer base with customization expectations. Customized subscriptions that simplify the experience follow expectations built by Amazon, Spotify and Uber. Creativity. The explosion of creative voices shepherded in by the internet unlocked a world of niche interests and imagination, democratizing the craft. OTT brings custom creativity built against this new world order and all its beautiful data. The power play now is in raising the creative bar and making this content exclusive to subscribers. Culture. Lives are now mobile and fluid. Entertainment is everywhere and ever-increasing. Whether gaming, film, music, episodic video or podcasting, our entertainment environments are custom built and self-defined by unique cultures and interests that are ever-expanding and seemingly limitless. The technological bonus of OTT is the ability to save content to mobile through download features, where the consumer no longer has to worry about a connection or WiFi to be entertained. Don’t wait. Embrace the new TV landscape immediately; waiting will age the brand in the eyes of consumers, widening a relevance gap. Think content, not spots. Look for unique ways to integrate. There is a vast creative ecosystem; find relevant partners and create stories together. Some platforms are ad-free, such as Netflix and YouTube Premium, requiring content integrations or content built around these stories as a way to have a voice. As an added bonus, data shows content has higher conversion rates. Build to passions, not just demos. Arguably one of the most entertaining custom experiences, use the data deeply to build contextual, meaningful advertising environments. Consider age. According to comScore, the heaviest streamers are 18-34 years old, followed by 35-44 years old. If your brand targets these two demographic darlings, you must be here with significance. Analyze in real-time. Immediate data means immediate optimization. Partner with the platform to predict where viewing is going, what shows will trend, what time people will watch and where and how they settle in to binge. This is the golden age of content and OTT is its mecca. There’s a surprising absence of brands creating in the space. Now is the time. People have shifted, now marketers must follow. Understand what story worlds inspire your consumer and find relevant partners to build experiences that bring value to both them and the brand.